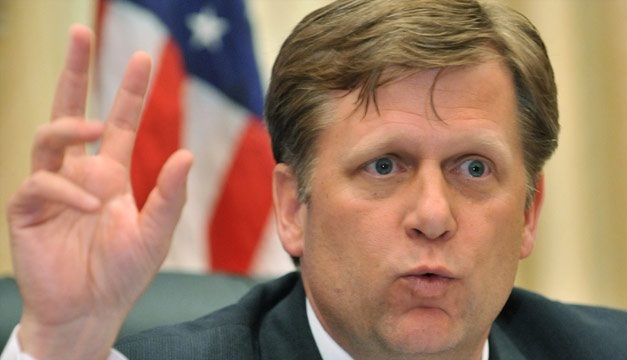 Michael McFaul, the U.S. ambassador to Russia, took to Twitter Thursday night to accuse Russian media organization NTV of hacking his cell phone and email account. “I respect the right of the press to go anywhere & ask any question. But do they have a right to read my email and listen to my phone?” he tweeted this afternoon. when McFaul arrived for a meeting with the group For Human Rights today, reporters from state-owned NTV began peppering him with questions that kept him on the freezing street without a coat.“Everywhere I go NTV is there. Wonder who gives them my calendar? They wouldn’t tell me. Wonder what the laws are here for such things?” McFaul tweeted. Russian news agencies said NTV dismissed McFaul’s complaint, and officials at the station, which is owned by Gazprom, the state-controlled monopoly, said they have a network of informants who provide them with information. Mr McFaul suggested the television reporters identified his timetable of engagements using illegal means. McFaul, who served on the National Security Council before becoming ambassador and was an advocate of the reset in relations with the Kremlin, added that Russia seems like a “wild country.” He later attributed that remark to his “bad Russian” and said that he intended to say that the NTV journalists were acting wildly, not that Russia is wild.McFaul is not the first ambassador to clash with allies of the Kremlin. Pro-Kremlin youth groups have in the past followed the British and Estonian ambassadors as they moved around Moscow.